Funeral Bookmarks Templates provides an easy way to quickly get started with the scratch for creating self-printable funeral bookmarks. 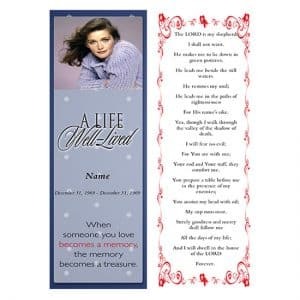 These funeral bookmarks can contain loved-one data, a photo and a short written obituary or funeral poem. 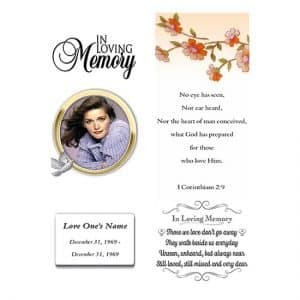 Self Printable Funeral Bookmarks allows you to add the contents of your choice with your preferred style. With the help of our online funeral software, You can fully customize the funeral bookmarks by adding your own contents. Here are some of Funeral Bookmarks Templates for you to get quickly started with online editing option. We have already published about “How to Write Funeral Program” using funeral templates. Now this time we are explaining “How to customize funeral bookmarks online”. If you wish to edit the text of the existing template, simply click on it. You will get a text box editor open and you will able to write. You will notice a new text box has been added with “Sample Textbox” written it in. Simply start editing that text normally. You are done with adding text. If you wish to delete a photo from the funeral bookmark template, simply click on it and you will get a toolbox with delete icon. If you wish to add a new photo, simply click on “Add Image” option. You will get an option to upload a photo from your computer. Simply choose a photo, and that will get added. If you wish to get HD PDF, simply click on the Download Printable PDF button. Your self-printable PDF file is ready to get printed. Labels are useful because you can simply insert a photo of your loved one on the front of the song or the verse from the Bible on the back. With templates, you can customize your own custom text and image if you want. You can print the marking shortly after you complete the marking. You can print on your personal inkjet printer or even at a local office.